Please note refunds can only be authorised by the Event Organiser and not by RaceNation. 2. A list of your events will appear, click on the event that the entrant has requested a refund for. 4. Use the Search facility to locate the entrant you wish to refund. 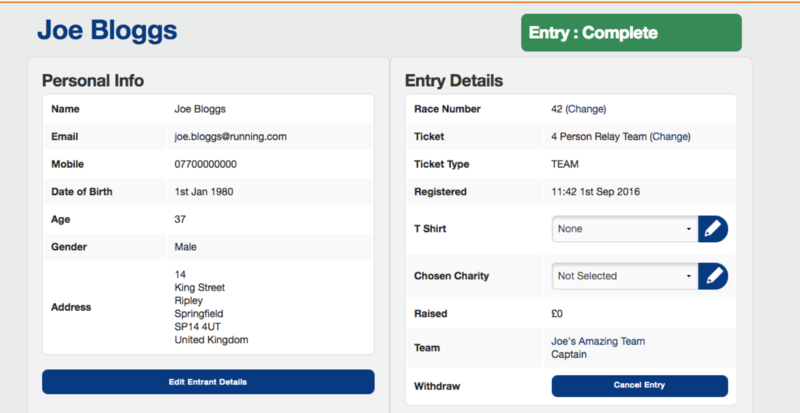 You can search by first name, surname, email or even race number if you know it. 5. A list of possible entrants will appear in a drop down, click on the entrant that you wish to refund. 6. This will take you to the entrant's order. Look for Cancel Entry. Click on this to start the cancel process. a. Cancel Entry, Cancel Number: Selecting this will remove the entrant from the race and destroy their race number. Use this if you have already sent our race numbers in race packs (for example). The number (in this case #42) can no longer be used again in this event. b. Cancel Entry, Release Number: This removes the entrant from the event, but frees up the race number. Use this if you have a finite number of race numbers and you need to re-use a previously allocated number. 8. A confirmation prompt will then appear to clarify your decision. Click OK to action the cancellation. You’ll be taken back to the Entries screen and you’ll notice a prompt that indicates the entry has been successfully cancelled.